Hobbs is at the forefront when it comes to offering state-of-the-art treatments. The AlterG Bionic Leg is one of the latest on offer. What is the Bionic Leg? The Bionic Leg is a wearable robotic device which provides assistance to extend the knee and provide stability for carrying out activities such as standing, walking and going up and down stairs. The motor assisted device is intention led, which provides assistance once the movement has been initiated by the individual. Sensors in the footplate and within the device detect weight changes and initiation of movement. 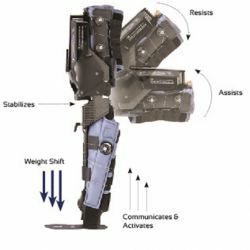 The settings on the Bionic Leg can be easily adjusted to provide variable amounts of assistance or resistance, dependent on the individual’s ability and the activity. People with severe lower limb weakness as well as mild lower limb weakness. This covers a variety of neurological conditions including stroke, multiple sclerosis, acquired brain injury, spinal cord injury and Guillain-Barré syndrome. A useful tool in neurological and orthopaedic rehab, it has shown good results in improving quality of gait, gait speed and lower limb strength. Is it for clinical use only? The Bionic Leg is easily portable with a smart, hard carry-case and can therefore be used in a clinical setting or home environment. Once set up by a trained clinician, you can then put on the device and input your own settings. Am I able to buy one? The Bionic Leg can be bought in the UK, but it is necessary to have an assessment and training session with a clinician in order to gain the most potential. The very nature of rehabilitation is that it is progressive and responsive to developments. The clinician will lead the programme in accordance with your outcome measures, tailoring the use of the Bionic Leg to access the optimum results and avoid the temptation to overdo things! What do those who have tried it say? Feedback has been very positive, mainly about improved confidence in the individual’s ability to weight-bear on their weaker leg. Because they are more confident using their affected limb, they are using it more which increases strength and therefore improves day-to-day capabilities. This means they are happy to attempt higher level gait training or exercises than they would previously have tried. The Bionic Leg is a robotic device that is worn externally on the weaker or affected leg. The Bionic Leg provides patient initiated motor assistance. Bespoke Rehabilitation packages are available, please contact us for more information. Website and all original content Copyright © Hobbs Rehabilitation 2006-2019, all rights reserved.